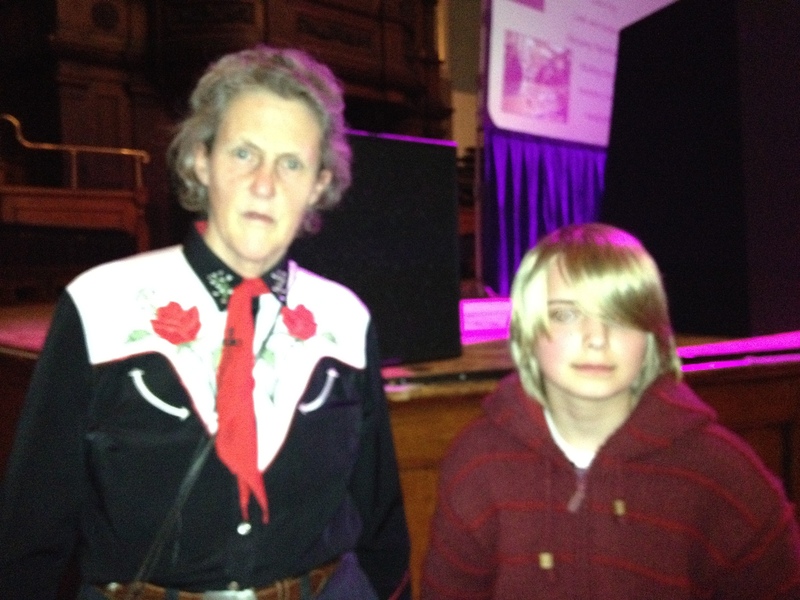 Home Autism Inspired: Son2 meets Dr Temple Grandin. Inspired: Son2 meets Dr Temple Grandin. Last night we had the privilege of going to see Dr Temple Grandin, the autistic woman famous for inventing humane animal handling systems. Dr Grandin is also a renowned expert on autism and Son2 was very keen to hear her speak. So off we went to Reading, but by the time we had arrived and found the Town Hall, Son2 had become overloaded, fallen into intractable silence and could not be persuaded to eat or drink anything. This was not looking good and I wondered if we should just go home. But I had only booked because he had wanted to go and I knew hearing Dr Grandin would be important for him. There was a while to wait before the show started and I offered Son2 some cash to see if he wanted to get anything in the cafe. Off he set, with me trailing behing him. His eyes alighted outside the auditorium on Dr Grandin signing books. He said nothing and we went down to the cafe where he could find nothing to his liking. Back we came and he slowed down at the book buying table. I asked him if he would like a book and to get it signed. He would. The queue had diminished and we got the last book. Son2 met Dr Grandin for a brief moment as she signed his name and hers and he went back to his seat clutching his signed copy. He managed a small drink and a bite of his sandwich. I knew that as soon as she started talking he would be transfixed and so he was, for a full hour. Dr Grandin spoke about how important it was to engage young people with autism, for them to participate through common, shared interests and how to teach them bottom up, not top down. By this she meant using specific examples to teach concepts, to teach the child according to the way he learns. She said it was also particularly important to discover the root cause of a child's problems, whether it was biological, sensory, fear/anxiety or a hidden medical problem. It was important to give an instruction for the type of behaviour you want, rather than a negative instruction. Dr Grandin said that much more research needed to be done into sensory issues, which Son2, in particular, is very sensitive to. She also pointed to how so many young people with autism were without basic skills and how fifties-style parenting, emphasising behavioural expectations by way of routine, benefitted young people with an ASD. Her advice to teenagers with ASDs was that if you find it difficult to interact with people socially, then impress them with what you can do - build up a portfolio of the things you are good at and play to your strengths because talent gets respect. In this way, you can find a place for yourself in society. We didn't stay for the Question and Answer session after the break - Son2's attention was exhausted and so was he. But he took a lot from it, I could tell. Dr Grandin is very similar in her thought processes to him and I believe he was inspired and comforted to realise that so many people had come to listen to someone just like him. Before we left, I asked him if he'd like his picture taken with Dr Grandin - because I knew he would. I explained to Dr Grandin that Son2 now needed to go home but he would really love his picture with her. "We'd better do it right now, then!" she said and Son2 quickly went to stand at her side. It's not a great quality image, but I know it's one Son2 will treasure. On the way home, he was ready to eat his sandwich and have a proper drink. It hadn't been an easy trip, but I know that he was satisfied and that's enough for me. Who will care for our vulnerable ‘Looked After Children’ in a care-less society?